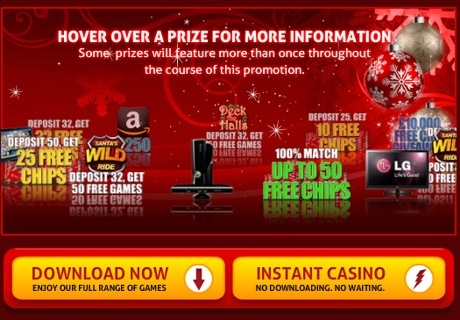 Christmas Prize Wheel Promotion At 32Red Casino - Win Prizes Every Day. Roll up! Roll up! 32Red presents you its Christmas Prize Wheel. With great bonuses, free chips, free games and fantastic prizes on offer every day between the 1st & 31st of December, this bountiful Christmas promotion will surely send your head in a spin. Just log into the casino every day and spin 32Red's Christmas Prize Wheel in the casino lobby to see what prize is up for grabs that day. Take a look at the carousel below to see what prizes you can expect this month. You'd be a wheel fool to miss out this Christmas! The Christmas Prize Wheel game is only available to real money players. You can only claim one prize/bonus per day. The offers are valid for the online casino play only. Each offer requires a seperate deposit. Wagering must be complete from one offer before the next offer can be claimed. Deposit Bonuses: Players must claim and receive their bonus before they start playing with their deposit. Free chip giveaways: Players meeting the deposit/playthrough requirements stipulated on the Prize Wheel will be selected at random and awarded with free chips. Players will be informed by email. Free games bonuses: Players must deposit the minimum amount displayed on the bonus wheel to receive the free games automatically. Free games awarded will be maximum lines, 1 coin at 0.01 coin size. Unused free games will expire at midnight the following day. Prize draws: Prizes shown are for illustrative purposes only, 32Red reserve the right to offer a similiar prize of equal value in the event of the advertised prize being unavailable. One entry per qualifying deposit/playthrough. The bonuses or winnings from free games will be credited to a player's Bonus Balance and are subject to 32Red Casino's bonus terms and playthrough requirements before being withdrawn. Get £32 free for every £20 deposited. Register an account with 32Red Casino today and claim a £32 bonus for every £20 deposited on your first purchase - up to £160 free cash bonus to start winning!